An upper ridge is pushed over Balkan peninsula and SE Europe as a large trough enters western Europe and continues towards central Europe. Two short waves affect central Europe, one moves from Germany towards Poland while another stronger one enters S-CNTRL France. Polar low effects Scandinavia while large low over Russia finally moves east. A MDT risk has been issued for E Czech Republic, E-CNTRL Slovakia, NE Hungary into SSE Poland with scattered severe storms, capable of producing large to very large hail, damaging severe winds, torrential rainfall and tornadoes. Storm intiation is expected by mid afternoon, associated with eastwards progression of the short-wave entering from Germany. While rather strong instability overlaps with moderate shear (deep-layer around 35-45 knots), favorable LL wind field supports enhanced SR helicity in the lowest 3km, ranging 100-300 m^2/s^2 locally. This will increase threat for tornadoes with the strongest cells. An ENH risk has been issued surrounding the MDT risk across E Germany, Czech Republic, Slovakia, NE Austria, E Hungary into W-CNTRL Poland where similar conditions are simulated, but more isolated severe storms are expected. However, strongest storms will be capable of producing large hail, severe winds and torrential rainfall. 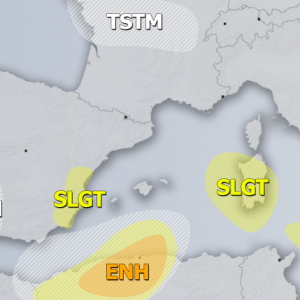 MDT/ENH risks have been issued for E France into W Switzerland, S Germany, N Italy and W Austria with threat for rather widespread severe storms activity associated with great forcing from the trough entering western Europe. Moist boundary layer placed under the left-exit region of relatively strong 60-70kt jet will support rather rapid storm initiation by early to mid afternoon. Storms will mostly produce threat for large to very large hail, severe winds and torrential / excessive rainfall. Clusters of storms into one of two large MCS systems is expected towards the evening when they move into the Alps / S Germany and continue well into the night. 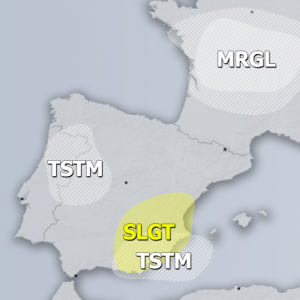 A SLGT risk has been issued for areas surrounding MDT/ENH risks across south-central Germany, Poland, Hungary, N Slovenia, N Italy south-central France into NE Spain where severe storms with more isolated coverage are expected. The stongest cells will still produce severe winds, heavy rainfall and large hail. 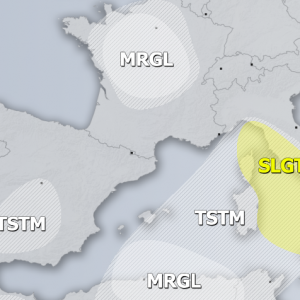 A SLGT risk has been issued for NE Morocco into NW Algeria with threat for isolated severe storms, capable of producing large hail and severe winds. Storms will be mostly diurnal driven and will diminish in the evening. A SLGT risk has been issued for W Russia on the wake side of large polar low. aorund 1000 J/kg of instability under moderate shear should support some isolated severe storms, main threat will be large hail, severe winds and torrential rainfall. A MRGL risk has been issued for N Sweden where some isolated storms are expected with the deep low travelling north along the Norwegian coast. Some isolated storms are possible, mainly with marginally large hail and strong winds threat. A MRGL risk has been issued for Georgia where some severe storms are likely in the afternoon, fueled by moderate instability and shear in place. Large hail, torrential rainfall and severe winds will be the main threats.